Last weekend I attended a workshop that was focused on drawing with pencil. I had decided to try it, because I had never been able to draw something more complicated than boxes and diagrams . The workshop was split into two days, 8 hours each. On the first day we were given a random photograph (portrait) and were asked to draw it. This task assessed our current level of drawing skill. Mine was, without surprise, quite low. By doing various exercises, we learned how to choose and hold a pencil properly, how to do shades and much more. The second day was dedicated to our final drawing. 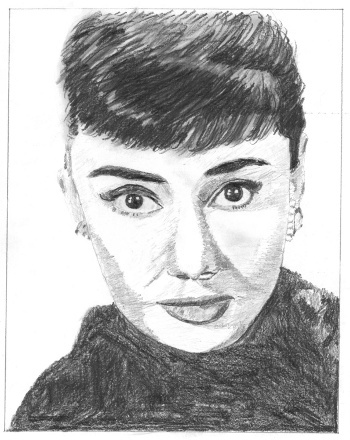 From all the options I chose a portrait of my favourite actress Audrey Hepburn. You can see the result for yourselves on the picture above. I was very surprised, how it ended up. I really enjoyed the weekend and got motivated to draw at home and improve. If it goes well and stays enjoyable, I will for sure attend another workshop. Last Friday I went for a run. It was quite hot, so I took a camelbag full of water and some protein bar to serve as emergency supply of energy. I planned to go to the river and then decide, what to do next, depending on the feeling. I felt quite well, so I decided to try a 20km route I had planned before, with the possiblity of breaking the 21.1km that I had been dreaming of for a long time. After approx 15km I got lost a bit in Vrablovec and could not find the right turn that would lead me home. Actually, I was looking for the turn so long, that after a while I appeared in the town of Hlučín (that means like +5km to get home). I was not so happy about it, but kept running. After two hours of it started to get harder and harder. I definitely underestimated nutrition and have to be more prepared and careful next time. At the time 2:30 I could not run further and had to walk the rest of the way home (at crawling pace ). I am glad I made it that far. For me it was my personal qualification to the half marathon in Olomouc, which is going to take place on June 23, 2012. I am looking forward to the challenge. Today I attended the event called Škodabike marathon 2012. It was a mountain bike race in the hills and forests near Ostrava, CZ. The weather was excellent, the heat wave that had come two days ago, served us almost 30 degrees in shade. The start was on the main street in Poruba. About 600 people attended the race, so it was pretty crowded near the start line. First kilometre we rode behind a police car that escorted us to the outskirts of Poruba, where the real racing began. Map of the race. Interactive version is here. The race course was very hilly. On the total distance of 38 km there were 930 height metres of ascent (see the activity log for details). I knew most parts of it, because I rode through the area many times, but several parts were totally unknown to me. The bike race was a new experience for me. I was not racing against other people (although I liked overtaking) nor time, but against myself, to find out, whether I can make it or not. I am happy I did. I am still waiting for the official results, but if I recall correctly, my time was 2:09:41. Graduating from the university was an important milestone in my life, especially because it significantly lowered my stress level and gave me free time and opportunity to exercise. And after almost two years of doing nothing except working, studying, eating and sleeping it felt great to do something else, outside on the fresh air. I have created a runkeeper profile and started logging my activities (bike and first experiments with running). After I had logged a few of them, it became a habit and also motivated me to keep trying. Having the data and the ability to see and measure my progress has been constantly pushing me forward (yes, I know I am a geek ). Eating properly is at least one half of the success. Even small changes can bring big results. Tracking progress and having as much data as possible to do so. From the points above I would like to discuss the first, because I think it is the most complex and important one. Last autumn and winter I started to train and exercise, but I was constantly hitting a barrier of nutrition. Although I was eating the right stuff, I felt tired, moody and not well. It culminated in December, when I was alternating between sick and ok almost every week. The turning point was actually a Christmas gift: I got a voucher for body assessment and professional advice on nutrition from my mom. I had wanted to have the data (body fat, muscles and so on) for some time, but I had not been able to force myself to actually get them. When I first contacted the nutrition studio, where everything should take place, I got an interesting offer: I could attend a twelve-week course with lectures, regular assessments and a diet plan that would fit them. I braced myself and took it. On January 15th I had a first session: a long questionnaire and first body assessment. The results were not so bad, but there was definitely a room (more like a gap ) for improvement. The following week I got my diet plan. Six meals a day consisting of ingredients that formed a compact whole that should „reduce“ me. In the beginning it was tough, my cooking skills were not astonishing, I had to weight everything, it took a long time and so on. I grit my teeth and endured. Each week it got easier and easier and after a while it became a habit. Nowadays I eat every 2–3 hours and it seems normal to me. All measurements were done using the same machine. They were also done in clothes, so the actual weight is a little lower, but the difference stays. The change is not only in numbers and results. I feel more healthy, have got more energy and generally am more happy after the course. Together with other events that had happened it has been gradually changing the way of my thinking from the pessimistic to more optimistic and positive. All it needed was a bit of inspiration, a small nudge in the right direction. I understand the methods mentioned are not for everyone, but if you have got a strong will (at least to start and try), I can certainly recommend the approach. I don't usually write book reviews. I think I have not written one since the grammar school, where it was a compulsory task. But now I have to, because this one really grabbed my interest. 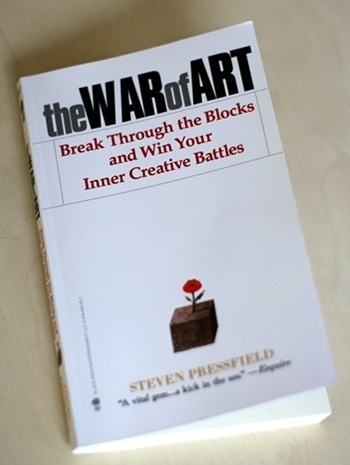 It is named The War of Art: Break Through the Blocks and Win Your Inner Creative Battles and was written by Steven Pressfield. I got the reference about it from a blog post from Tomás Vergara through his movie The Chase, which was advertised on The Pirate Bay. I read some reviews on amazon and got the book. As the title says, the aim of the book is to „wake up“ the reader to embrace one's self creativity and hidden potential. It does so in three stages: first, the Resistance, which personifies dark forces of self-sabotage that each of us have inside, and its manifestations are identified. Second, Pressfield teaches about becoming „a pro“ and difference between amateur and professional in the relation with the Resistance. In third, final stage revolves about the idea of Muses and Angels and how they help you with doing the creative work. I felt pretty much moved by the book, identified myself with several situations described and also stared with open mouth on simple ideas and thoughts, that were so simple it had never occurred to me it could be so simple and easy. Unlike numerous books on procrastination, the War of Art does not try to cover it with fabricated systems that should „just“ make you more effective, but goes directly to the cause of problems and curing them – the Resistance and how to fight it. I read it two times in a three day span and am for sure going to read it again when the ideas sink in more deeply. I recommend it for people, who are open minded and seek inspiration for their artistic/creative development. A month ago I made a post about the C25K running programme. Today I have successfully finished it! What seemed like a science-fiction nine weeks ago (to run 5K in 30min in a steady pace) has become real. I can recommend the course (or any similar interval training course) to people, who want to start and/or improve in running. The alternating walking and running present in the first half of the course helps a lot to alleviate the pains and aches in muscles and improves the recovery in the later stages. My next running goal is to gradually increase the distance to achieve a 10K in 60min. Quite recently, not more than two weeks ago, I have moved to a new place in Ostrava. It took me a while to move back to the city, but with the start of the new year things have finally started to change (maybe as a subconscious New Year's resolution ). So no more commuting and organising my life around buses' timetables. The location is just perfect for me, it is 5 minutes to work, 5 minutes to gym/swimming pool and one minute to the convenience store. 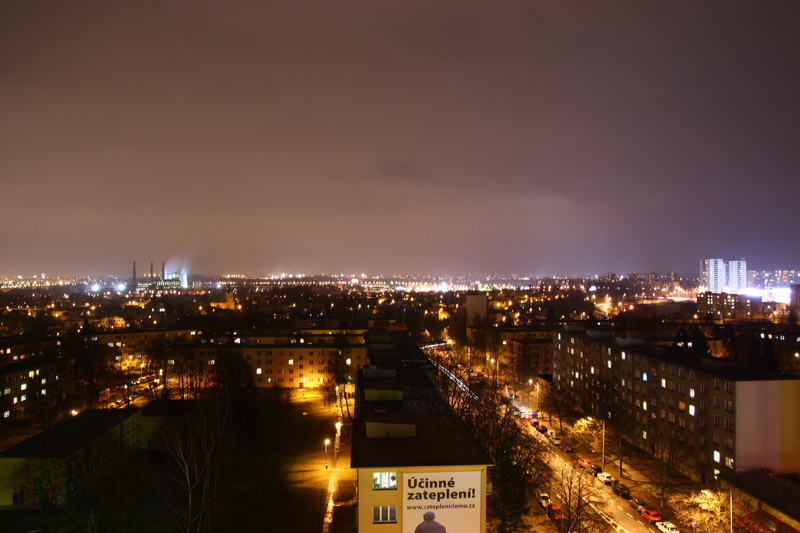 And, since it is in 12th floor, I have a nice view too – I can see the all major factories of Ostrava . Ostrava by night (from my window). Larger version. The flat itself is still considered „work in progress“. I apply the approach of gradual improvement: I do not try to do everything at once, but take small steps and never stop. It seems more manageable and definitely more fun. One of my new years resolutions (that were reasonable and not dismissed) was to start running. I started running some time ago, even ran one race), but my training was not consistent nor organised in any way. With time I got better, but I felt the result could be better. My brother recommended me C25K training (Couch to 5K) and after some research I decided to give it a try. The training consists of three sessions per week. Running and walking are alternated in various periods of time. Each week the amount of running is increased and amount of walking decreased. Today I finished the Week number 5. So far it feels manageable. My average and maximum heart rate and also my recovery rate increased a lot. If I keep up with the pace, finishing the course should be a milestone in my running practice.